Not everyone who says to Me, "Lord, Lord," shall enter the kingdom of heaven, but he who does the will of My Father in heaven. Many will say to Me in that day, "Lord, Lord, have we not prophesied in Your name, cast out demons in Your name, and done many wonders in Your name?" And then I will declare to them, "I never knew you; depart from Me, you who practice lawlessness." Recently I received a question from a reader about this passage. He wondered how I would respond to the charge that this passage teaches that one must submit to the Lordship of Christ to be saved. The interpretation of this passage hinges not on the expression, "Not everyone who says to Me, 'Lord, Lord,'" but on the expression, "He who does the will of My Father." Jesus did not say that no one who says "Lord, Lord" will enter the kingdom. He said, rather, that not all who say that will enter. So, who among those who say "Lord, Lord" will enter? Answer: those who do the will of the Father. What, then, does Jesus mean by the will of the Father and who are those who do it? One popular view today suggests that by the expression "the will of My Father" Jesus meant a life characterized by obedience to all that the Father has commanded. Thus those who do the will of the Father would be people who live godly, holy lives. God is perfect and one cannot enter His kingdom without becoming absolutely perfect (Isa. 64:6; Gal. 3:6-14; Heb. 10:1-18; James 2:10). One cannot be said to have done the will of the Father unless he does it completely, 100%. To violate even just one of God's commands is to break them all (James 2:10). Even if these first two objections were not valid, this view leads to the unbiblical conclusion that no one can ever be sure that he is saved until he dies or is raptured. No one could ever know if he had obeyed enough. Yet the Scriptures are clear that the apostles knew with absolute certainty that they were saved and they wanted their readers to know this as well (Luke 10:20; John 13:10; Rom. 8:31-39; 2 Pet. 1:1; 1 John 2:12-14, 25; 5:13). There is another view as to what Jesus meant by the expression "the will of My Father." [inlet]When Jesus spoke of doing the will of the Father to obtain kingdom entrance, He had one act of obedience in mind: believing the gospel. [/inlet] It is God's will that none should perish but that all should come to a change of mind about the gospel (2 Pet. 3:9). When asked the question, "What shall we do, that we may work the works of God?" Jesus said, "This is the work of God, that you believe in Him whom He sent" (John 6:28-29). Since in the view of the early Christians, the supreme disobedience was a refusal to believe their gospel, apeitheo may be restricted in some passages to the meaning disbelieve, be an unbeliever. This sense, though greatly disputed (it is not found outside our literature [i.e., outside the New Testament, the Apostolic Fathers, and other early Christian literature]), seems most probable in John 3:36; Acts 14:2; 19:9; Rom. 15:31. A person who trusts in Christ alone obeys completely the will of the Father to believe in Jesus Christ alone for eternal salvation. Such a person obtains absolute perfection before God [positionally speaking] since Christ takes away all of his sins and gives him His righteousness in exchange (2 Cor. 5:21; Col. 2:13-14; Heb. 10:1-18). And, such a person can be 100% sure of his salvation since he can know with certainty that he has done the will of the Father (in relation to the gospel) once and for all (cf. John 3:16; 5:24; Rom. 8:38-39; 1 John 5:13). Acts 5:32 and Acts 6:7 also refer to believing the gospel as an act of obedience to God. This passage, rather than supporting the Lordship Salvation or Works Salvation positions, actually contradicts them. Probably many of those who will say "Lord, Lord have we not prophesied, cast out demons, and done many wonders in Your name" are people who in this life were pastors, evangelists, missionaries, and the like. They may have baptized many, prayed and witnessed much, and done what they thought were many deeds which made them think that they were probably saved. Notice that Jesus does not question whether they actually did such deeds. Yet He rebukes them for not doing the Father's will and He denies them kingdom entrance. Those who do not believe in Christ alone for their salvation have failed to do the will of the Father. I do not believe that those who hold to Lordship Salvation or even Works Salvation are necessarily unsaved. Many people who now believe in Lordship Salvation, and even some who now hold to out-and-out Works Salvation, came to simple trust in Christ alone at some point in their lives and later became confused about the gospel. On the other hand, it is a sad possibility that some in the Lordship Salvation movement and many, if not most, in the Works Salvation camp have never placed their trust in Christ alone. They may go to their graves preaching passages like Matthew 7:21-23 only to find out that Jesus was talking about them, not someone else. I hope and pray that such people wake up before it is too late. The way that leads to life is narrow (Matt. 7:13-14). Jesus is the way, the truth, and the life; no one comes to the Father but by Him (John 14:6). Self-righteous people are on the wrong path. They are on the broad way that leads to destruction (Matt. 7:13). Jesus came to save those who know that they are sick and lost and in absolute need of His deliverance (Matt. 9:12-13; Mark 2:17; Luke 5:31-32; 18:9-14). Of course, that is all of us, all of mankind. However, some people are unwilling to own up to the truth. The cross of Christ is a stumbling block to those who think that they are good enough to deserve kingdom entrance. Those who throughout the course of their lives reject the free gift of salvation and refuse to trust in Christ alone will find out that in reality they are sinners, those who "practice lawlessness" (Matt. 7:23). Only then it will be too late. What would you say if you appeared before God and He said, "Why should I let you into My kingdom?" Matthew 7:22 is the wrong answer. The right answer is, "Lord, I am an unworthy sinner who has placed his complete trust upon what Jesus did for me upon the cross, and He promised that whoever believes in Him has eternal life" (Luke 18:13-14; John 3:16; Rom. 4:5; Eph. 2:8-9; Titus 3:5). May we call people to do the will of God so that they can obtain entrance into the kingdom of God. Those who place their trust wholly in Jesus Christ have done the will of the Father and have already passed from death to life (John 5:24) and will not come into judgment regarding their eternal destiny (John 3:18). At last the Gospel of Jesus Christ assumes the center of all our attention. It is the will of the Father for us to simply believe in His Son. Thank you Chad for the article by Bob Wilkin. I always tell Christians and of course other people, that it is the one you serve who is your true master, no matter what you say to the contrary. If you are lying, stealing cursing, and living a life of deliberate sin, then even if you continually state that Jesus is your Lord and Savior, your actual master is Satan because it is his will you are doing and not that of our Holy Father Almighty God. This is the gospel which was preached to me. I am trusting in the blood of Jesus to save me. Nothing else can. I'm not at all sure about this interpretation. 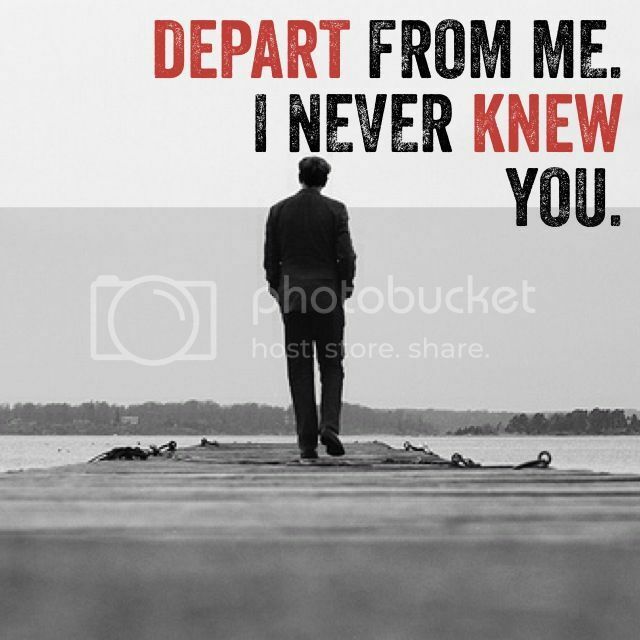 Jesus' words are, "I never knew you; depart from Me, you who practice lawlessness." Lawlessness seems a very odd way to describe people who refuse to accept the gospel. "Unbelievers" would be much more suitable if that was what Jesus meant. This is followed by the parable of the wise and foolish builders "Therefore everyone who hears these words of mine and puts them into practice." This is the conclusion to Jesus teaching on the mount. "These words" must refer to Jesus instructions on prayer, anger, hypocrisy, fasting, lust and so on. Entering the kingdom of God is not a matter of merely using Jesus' name, it is living out his teaching. Anyone who thinks otherwise is building on a shaky foundation. The one whose will you are doing is your true master, no matter what you say to the contrary. Lie, cheat,curse. steal, like many TV preachers are doing, who claim they are doing Gods work, are in fact agents of the devil! Then you have been taught a partial gospel. Well, what's the rest of it then? There is no such thing as a partial Gospel. That is the Gospel given to us by the apostles and that is the Gospel that the scripture declares. such thing as a partial Gospel. Now what is the 'will of the Father' who is in heaven? will have eternal life, and I Myself will raise him up on the last day. So we have firmly established the Gospel and also what the 'will of the Father' is. The will of the Father is that you believe in the Gospel of Jesus Christ. There's one gospel, and none of us has grasped its depth and breadth fully. Our understanding is partial. @DHC Your interpretation of Jesus words in Matthew 7 rests entirely on importing verses from elsewhere in the Bible. When Jesus says "these words of mine", he must be referring to his teaching in the Sermon on the Mount. Unbelievers don't call Jesus Lord and neither do they prophesy in His name, or even attempt to work miracles, because they don't believe in them. How many unbelieving atheists do you know that call Jesus Lord and do works in His name? Those who don't enter the kingdom are believers who are not obedient. Firstly, what is meant by "entering the kingdom"? What does the kingdom mean, and does it mean they lose salvation? Well, thankfully, entering the kingdom of God does not mean salvation. Entering the kingdom of God is a reward for faithful believers, and it means participating in Christ's millennial kingdom on earth, the restored kingdom of David (Acts 1:6). Matthew 16:27 [COLOR=#001320]For the Son of Man is going to come in his Father's glory with his angels, and then he will reward each person according to what they have done. Is Christ teaching salvation by works here? No, it does not say that Christ will save people, according to what they do. It says reward, and participating in the first resurrection and entering the kingdom is a reward (Rev 20:6, Rev 22:12). The problem is that free gifts of grace that we do not earn, are confused with rewards given freely out of loyalty and faithfulness that we do earn. [/COLOR][COLOR=#001320]We must distinguish between gifts of grace that we cannot earn, such as eternal salvation, and rewards based on our own faithfulness and loyalty to Christ. [/COLOR][COLOR=#001320] The concept of reward for good or evil is throughout the book of Matthew, and continues throughout the Bible, even in Revelation we find the concept of reward, crowns etc. Still bouncing around passages all over the Bible and not paying that much attention to the text. Thanks for the reply and your point was noted. DHC Your interpretation of Jesus words in Matthew 7 rests entirely on importing verses from elsewhere in the Bible. When Jesus says "these words of mine", he must be referring to his teaching in the Sermon on the Mount. No problem Hekuran, I will address this shortfall immediately and retain the due context. to life, and there are few who find it. This is the Gospel of Jesus Christ, where Jesus is the gate and few find it. second part of your statement. Acting on the words that Jesus spoke? to a wise man who built his house on the rock. Ps Hekuran, the rock above is the Gospel again by the way. Jesus explains what he means by the building on the rock metaphor. "Everyone who hears these words of mine and puts them into practice is like a wise man who built his house on the rock". The rock is Jesus' teaching in the Sermon on the Mount, Building on the rock is putting that teaching into practice. [COLOR=#555555]48 Therefore you are to be perfect, as your heavenly Father is perfect. Hekuran you must be perfect! I appreciate the compliment, but I assure you it's not true. The word perfect is often confused in this case the rendering is to mature.If you think you have to be PERFECT as in thinking no mistakes.You have gone down the wrong road and making it impossible on yourself and others.Something is fishy here i gave the correct answer that would explain the original question here why did it not post.the question of Matthew 7:23 this iniquity is the key word.If you are being accused of this would it not be most important to find its meaning and its root word.If you do this it explains itself.This question i have debated with PHDs of linguistics and religion at numerous well known universities UNC,Wake Forest.Duke,Florida ST,Appalachian ST,and many others they all say this is the way to the correct answer.The problem is most preachers do not know why the commandments were given what they are or what there function is.When you know this Romans and Galatians can be read intelligently.Remember he says we MUST worship in spirit AND truth.His spirit is why we simply believe the truth is you had better not take away from it.Even so there is a way that SEEMS right unto a man.A cunningly devised doctrine of man will cost you your salvation with reward ( Holy Priesthood ) or a common salvation applied to all men.Yes you are saved by grace either way.The weeping will be when you see first hand what you could have had. I don't really agree with your definition of a believer here, so it makes sense that we would come to differing positions on this topic. I think there are only two types of people in the world, unbelievers and believers. Wise people, and foolish people. Those who are saved, being saved, and will be saved, vs those who are damned simply because they don't believe on the name of the Lord Jesus Christ to save them. Many people have heard of Jesus, have been taught about Jesus, and think that they believe in Jesus, but don't have an ounce of faith in him. Faith comes by hearing, and hearing by the Word of God (Jesus). Jesus gives men the hearing and the preaching required to have faith. Without Christ opening men's hearts and having His words preaching into them, no man would have any faith (not the kind we are referring to here in the bible at least). Churches across the world are filled with unbelievers who look like believers to the casual observer. The fool says in his heart, 'there is no God.' He doesn't necessarily say it with his mouth though, he may very well say that Jesus is God with his mouth, but in his heart and with his actions he says, 'there is no God." I don't consider wolves to be believers, I consider them to be unbelievers, but yet they come in sheep's clothing, appearing to be genuine sheep. It's because we don't have complete discernment that we often can't tell the difference between who is a believer and who is an unbeliever. Many in both categories seem to appear to be in the other from time to time. I'm sort of familiar with the doctrine you seem to be referring to in your last post James, I first read about something like this in a book by a proponent of it named Robert Govett, who was a contemporary of Charles Spurgeon. I'm just curious, where did you get some of your ideas regarding 'The Kingdom," and entrance into it based on reward? I don't hear a lot of people talking about this doctrine. Right before Jesus says, "Not everyone who says to me, 'Lord, Lord,' will enter the kingdom of heaven..." he is talking about false prophets and how to tell the difference between the true and the false. I think this is pretty significant. Thus, verses 21-23 seem to fall right in line with what Jesus was saying in 15-20. False prophets don't tell you they are false prophets, they tell you they are legitimate prophets of God. They say and do things to try and get you to believe they are the real deal. If discerning between a false and true prophet were an easy thing to do, I don't think the scriptures would be full of warnings about how to recognize false ones and what they are like. Most of us at one time or another, or even still to this day, have or are following the guidance of a false prophet who seems to be speaking in the name of Jesus. They are a false prophet, yet they still say with their mouths that Jesus is Lord. It's what they are not saying, or what's 'between the lines' in what they are saying, or what's really under the surface in what they are saying that is misleading people and leading them astray. False prophets are deceived and are deceiving others. The thing about false prophets though, is that they always believe that they are truly speaking for God. Satan has so blinded their hearts and their minds that he has got them to really believe they are doing the works of God, when in fact they are totally and utterly serving him (Satan). I believe it is this group of people (false prophets) mainly whom Jesus is addressing in 21-23. I think he is saying that many who appear to be leaders and oustanding Christians in this lifetime will actually end up being completely rejected by Jesus Christ on that day. We should not seek to be like the flashy false prophets who come in sheeps clothing, for their end is destruction, but we should be the true sheep of God, who are dumb, blind, and stupid, and who know they cannot save themselves, but need a shepherd to lead and guide them. Such a person obtains absolute perfection before God [positionally speaking] since Christ takes away all of his sins and gives him His righteousness in exchange (2 Cor 5:21; Col 2:13-14; Heb 10:1-18). And, such a person can be 100% sure of his salvation since he can know with certainty that he has done the will of the Father (in relation to the gospel) once and for all (cf. John 3:16; 5:24; Rom 8:38-39; 1 John 5:13). These people in Matthew 7: 21-23, whoever they are, evidenced something very key with their words. They said (will say some day) when Jesus rejected them: "did we not prophesy in your name, and cast out demons in your name, and do many mighty works in your name?" They weren't trusting in Jesus's blood to save them, they were trusting in their own works to save them. They thought that by doing these flashy works for all men to see, that they were doing the works of God, and could earn their own salvation. They put on a garment of "righteousness" (if you can call it that) over them to cover their uncleanness, but they were never changed, healed, or cleaned on the inside, in their spirit. They totally missed the whole point of the gospel, and never actually had any relationship with Jesus at any time at all, otherwise he would not say, "I never knew you." These men whom God rejects here, thought in this lifetime they were part of the fold of God, but in reality they were always the servants of Satan, fooled by him to do his bidding. How utterly tragic. Every single person who is trusting in the blood of Jesus to save them will be saved. Every single person who rejects the sufficiency of the blood of Jesus to save them and relies on their own ability to save themselves instead or in place of that blood will be lost. That is the gospel I know in a nut shell. I agree with you on the link between the warning about false prophets and the passage at hand. But the focus on the blood of Jesus still feels like it's shoehorned into this text. There's nothing in the Sermon on the Mount that points that way. And I don't see anything to suggest that Jesus was entering a debate on Works v Grace here either. When you talk about being changed, cleaned and healed on the inside, that sounds much more in keeping with the themes of Jesus' teaching here. From the first to the last of the Sermon on the Mount, the clear message is that Jesus demands nothing other than a radical overhaul of every aspect of our lives.